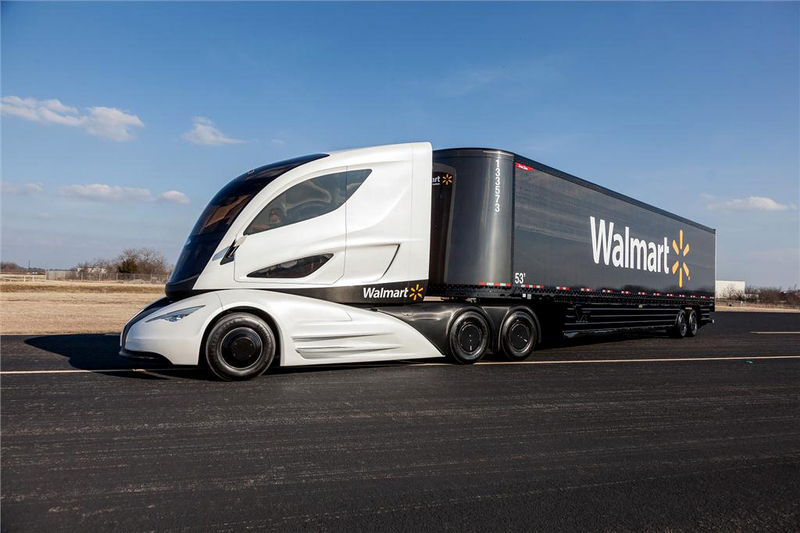 The new sleek-looking WAVE concept truck from Walmart. The cab is highly aerodynamic while the trailer is made almost entirely of carbon fiber. Now here’s an interesting development given that experimental ‘concept’ trucks usually emanate from the design rooms of the truck manufacturers. 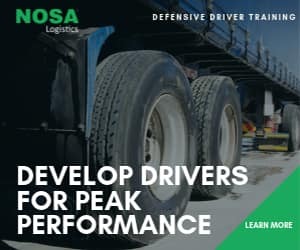 This time, the initiative is being driven by a user of trucks, Walmart, in collaboration with Petteril, Great Dane Trailers and Capstone Turbine in the USA. 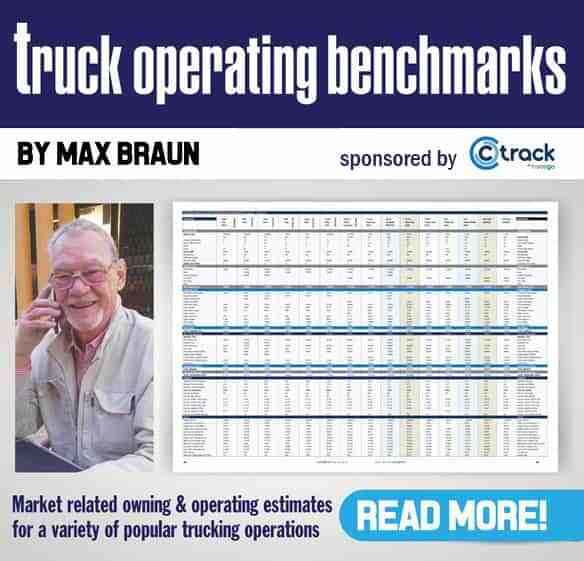 As the largest retailer in the world, Walmart runs one of the largest private truck fleets in the world and with the aim of protecting the company’s bottom line as well as the environment, Walmart says it wants to double the efficiency of its truck fleet by 2015. 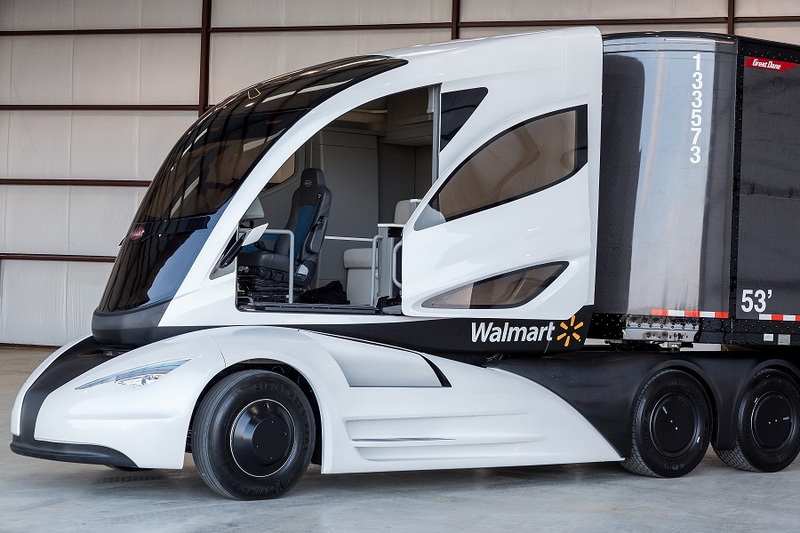 As part of its plan to reach these goals, Walmart has unveiled the Walmart Advanced Vehicle Experience – WAVE – a concept for a new, highly efficient truck. As you will see from the accompanying photographs and the video, WAVE’s cab has been designed to incorporate highly advanced aerodynamics while the trailer is made almost entirely of carbon fiber. The rig is powered by a hybrid powertrain which the company describes as a prototype advanced turbine-powered, range-extending series hybrid powertrain combined with an electric motor and battery storage system. The distinctive look of WAVE is not only apparent from the outside but inside, the driver is seated in the middle of the cab and the conventional gauges are replaced with LCD screens. It also incorporates a full sleeper facility. The WAVE’s trailer is designed with a convex nose to reduce drag and increase cargo space, and the carbon fiber trailer is about 1 815kgs lighter than conventional USA trailers, thus allowing WAVE to carry more cargo without sacrificing power or fuel consumption. According to Walmart, the 16m side panels are the largest single pieces of carbon fiber ever made. So when will it go into operation? Unfortunately, as with most concept vehicles, we’re not likely to see it on the roads soon. 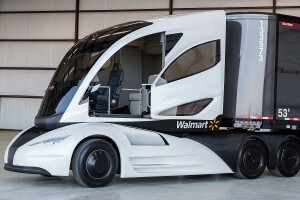 In fact, it may never reach the road but, as with all concept trucks, it serves as a means to test new technologies and apply the lessons learnt to existing trucks in the Walmart fleet. Looking at this sleek machine – as well as other concept trucks developed by truck manufacturers around the world – it becomes obvious that our great grandkids are going to experience a totally different truck world to the one we are living in. With Walmart now operating in South Africa, here’s a tip to the designers: If you haven’t made provision in the cab for the driver to use a gas stove to cook his pap when driving, you won’t cut it in South Africa? Only joking!